BTM’s hand held Tog-L-Loc® units are an economical approach to fastening sheet metal assemblies. Stand Alone self-contained, Pneumo-Hydraulic units, Hydraulic units, Pneumatic units and Battery/Electric units are available. You can download our hand held catalogue which contains detailed information or contact BTM with any special requirements. BTM’s Heavy Duty Tog-L-Loc® Unit is commonly referred to as the 7006 unit. These units are usually used in the industry for prototyping and small run production. Two hand unit styles are available to suit your manufacturing needs, the difference being the style of anvil. The customer’s part design will dictate which anvil style will be required. A spring or air balancer is required to operate the unit, and a gyro ring is sold separately to allow for 360° rotation on 3 axes. 7006 Units are operator independent, once the triggers are depressed the unit will complete a full cycle – maintaining joint repeatability. These units require a hydraulic power source. 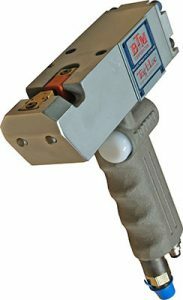 The Lit-L-Loc® range of hand held clinch units are light weight robust units operated via 6.0 bar clean compressed air. The complete system consists of an intensifying booster which converts shop air into hydraulic force, a 2.0 metre hose assembly and hand unit with two sets of Tog-L-Loc® tools. The Tog-L-Loc® Punch and Die tools are reversible within the unit to form the “button” in either direction. The guns can be set up to join a range of thicknesses or optimized for a specific metal thickness. Standard throat depths are: 11.0mm, 48mm & 85mm. Use with BTM standard 2.0 metre hose assembly No. 711100B or optional 3.0 meter hose assembly No. 711100C. This new patented Crocodile Clinch Unit is purposely made for ducts in the Hvac Industry but can also be used in many other applications where the need to clear return flanges is necessary. 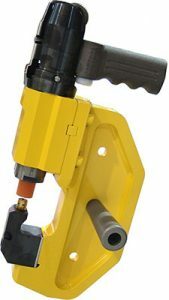 Suspended from a spring or air balancer this is a very easy to use unit due to its in-built 360 degree rotating handle allowing the operator to turn from a horizontal flange to a vertical flange in the `twist of a wrist`. The Ducting Crocodile Clinch Unit is operated via a separate intensifying booster connected to 6.0 bar clean compressed air. 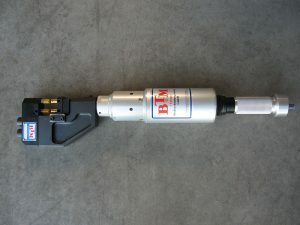 A 4.0 metre hydraulic hose connects the booster to the clinch unit allowing the operator freedom of movement around the component being clinched. The new Battery Clinch Unit was developed to allow the Tog-L-Loc process to be used away from any power sources. It allows total freedom for example on a construction site in the Modular Steel Frame Building industry where it is difficult to use compressed air or where you just need that extra bit of portability. Used with a shoulder strap or suspended from a balancer coupled with the option of using as a mains electric unit operated via a simple transformer turns this unit into a truly adaptable and portable unit. BTM’s Bayonet units are very robust and highly manoeuvrable. The gun features a bayonet action which opens 50mm to clear the lip of the part while maintaining a 6.0mm OSHA compliant stroke. The system requires compressed air at only 80 psi (5.5 bar) for operation. The complete system consists of a intensifying booster (as per the Lit-L-Loc booster assembly) which converts shop air into hydraulic forces, a 2.0 meter hose assembly and the Bayonet unit itself with two sets of Tog-L-Loc® tools. The Tog-L-Loc® Punch and Die are reversible within the unit to form the “button” in either direction. The guns can be set up to join a range of thicknesses or optimised for a specific metal thickness. Standard throat depths are 25 & 50mm but custom made units are available. Contact BTM for your specific requirements. 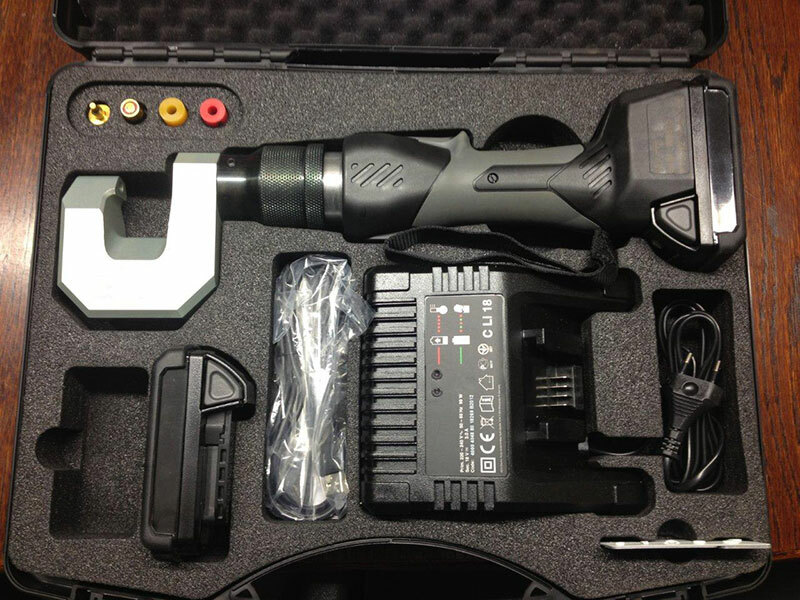 The UniClinch unit is a self-contained air hydraulic clinch joining tool. The design allows the user to work using rapid strokes and considerable force. Tog-L-Loc® can be used for sheet metal up to 2 x 1.5mm thick. The tool is both light-weight and well-balanced to minimize the strain on the user. The tool has few moving parts and has a high level of operational reliability.